Jean-Francois Flechet began the restaurant enterprise Taste of Belgium with just a cast iron waffle maker at the back of a crowded produce store. Five years later, Flechet’s creativity, drive and business sense transformed Taste of Belgium into a growing business with multiple food establishments, including a Belgian-inspired, full-service restaurant and bar, an elegant bistro and market stands in multiple cities. Flechet and his restaurants epitomize the Belgian zest for living and the country’s zealous democratic spirit, and LPK partnered with him to create a brand experience and identity that represents more than just a Belgian waffle business, but a lifestyle. If you haven’t tried Flechet’s now famous waffle and chicken or his Belgian frites, boulets liégeois (Belgian meatballs) and goetta hash, stop by one of his bistros or market locations. Until then, here’s a sneak peek at how LPK has helped Taste of Belgium bring people together to eat, drink and live like a Belgian. In Belgium, the waffle is traditional “street food,” accessible anytime to anyone. For Taste of Belgium, the waffle is where they started, but it’s also a sweet and satisfying canvas on which to create new ways to enjoy food. 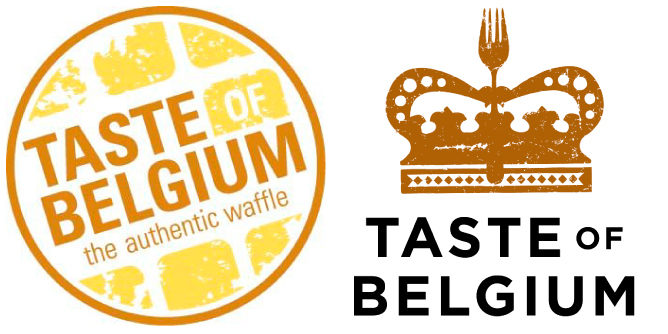 LPK’s redesign for Taste of Belgium reflects the brand’s growth beyond the original waffle stand. The playful fork in the crown of Belgium conveys the brand’s evolved and broader offer of an exciting array of “Belgian-ized” dishes, beverages, authentic attitude and European atmosphere. LPK helped Taste of Belgium define itself as a brand built on tradition and quality, leveraging its rich history and its modern awareness of the consumer experience. To engage the community in the brand’s story, we crafted a tone of voice for the brand that outlines how to “Break the Food Rules.” A few tips for starting the conversation? Twist tradition’s belly fat until it squeals and thumb your nose at convention with unexpected combinations. At the heart of Belgian culture is a history of individualism that bucks authority and dismisses the establishment. For Belgians, rules are meant to be broken—or at the very least, mocked. LPK helped Taste of Belgium establish a narrative that captures that spirit of democratic individuality. And what’s more democratic than a waffle? It transcends differences—be they cultural, political or culinary. Within a world of disagreement, a waffle brings people together—which is the core of what Taste of Belgium believes in. Understanding that genuine Belgian experience helped LPK develop the Taste of Belgium brand foundations and brought our design for the brand to life across its retail and online settings. 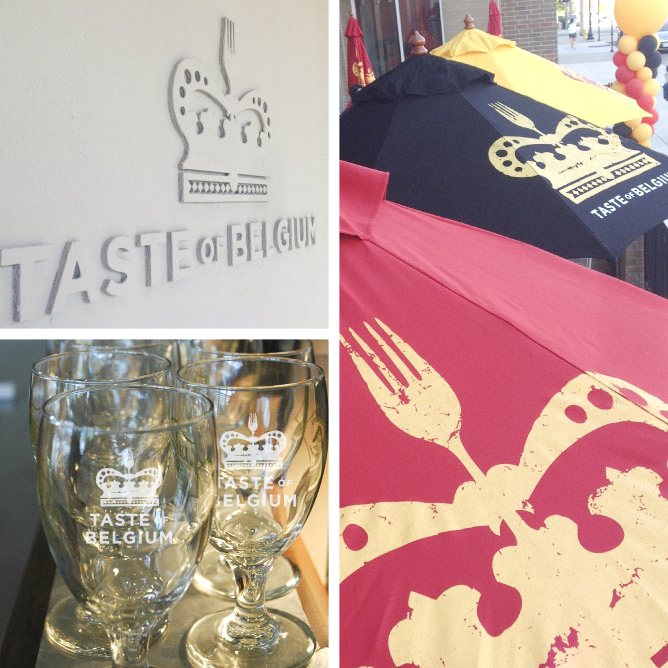 The new brandmark can be found at every touchpoint in Taste of Belgium’s new Short Vine location. Our favorite? When you order their mouthwatering, signature frites, the brandmark is right on the craft paper they are served in—a multisensory brand experience. 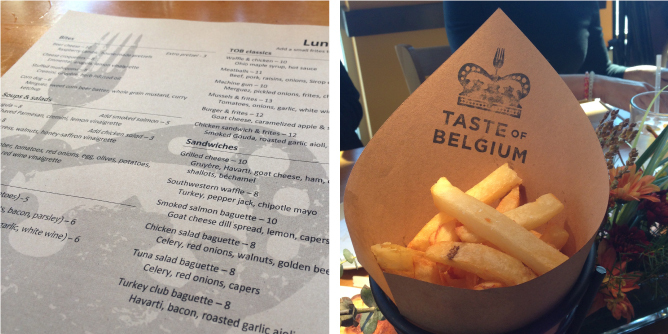 Taste of Belgium’s newest location is on Short Vine in Corryville. 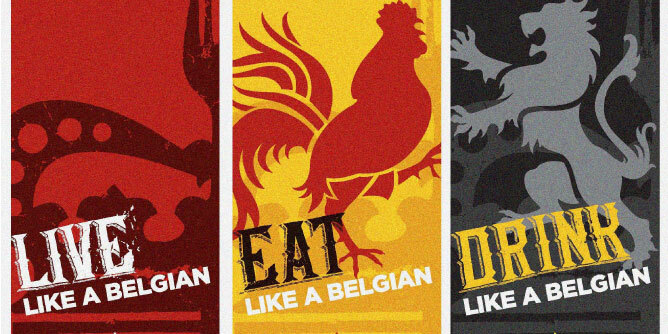 To find a Taste of Belgium near you, visit their website.